Get out from behind your desk. Untether yourself from your computer, be mobile and teach from all four corners of the classroom. 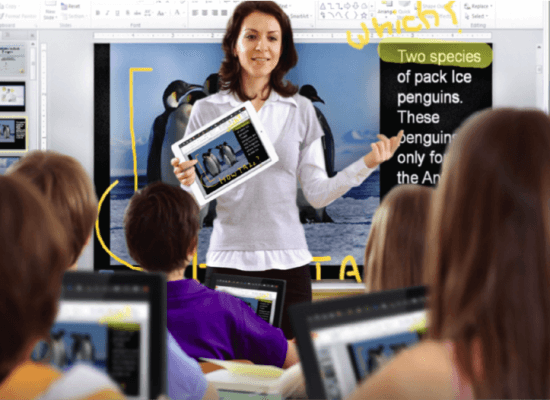 Control your presentation and your SMART board – or Promethean ActivBoard – directly from your tablet. Walk around the class to monitor your student’s progress without losing lesson flow. Great for improving classroom management! Don’t have a SMART board or Promethean ActivBoard? Then use your tablet instead. Use the toolbar to annotate over any content including websites and videos. Want to explore an idea? Pull up blank, ruled or other backgrounds – even include your own worksheets! Record your sessions for later playback – great for flipped classrooms! Share anything from your own – or any student – screen instantly and in real-time, including video and audio. Don’t waste time preparing existing documents and uploading them to a cloud account. Students can view your Windows or Mac screen directly in front of them within seconds! Pass control and let students interact and take turns to lead the presentation. Or let students wirelessly connect via your computer attached to the projector to mirror their own device. Compare multiple students work side-by-side. Don’t let their ideas sit on their screens any longer! Now the visually/hearing impaired or disabled student can participate in the lesson from anywhere in class – and without moving from their seats. Learn more. Connect with your audience in new ways. No longer the ‘sage on the stage’, interact with the room and never lose control of the presentation flow. You’ll be the presentation people won’t forget! Access all your applications directly from your tablet. No need to ‘buy an app for that’. Use what you already know and have paid for – even your SMART Board and Notebook lessons and tools are accessible! Project your lesson to your students’ screens. No need to fumble with cables or switch panels. Bulb blown? No problem! Great for crowded labs – now everyone can see the lesson! Teaching Photoshop or a programming course? Working in a lab crowded with computers and monitors for each student isn’t much fun. Many times the projector screen is obscured from students – especially at the back of the room. By using Splashtop to broadcast and project to all the student monitors, everyone in the lab can see the presentation! Now students have a clearer view of the lesson. Pass control so they can interact with the application to demonstrate their understanding without moving from their desk. Splashtop partners with you on your EdTech journey. So whether you start small with a teacher and single iPad – then grow to support carts full of Chromebooks or iPads or Surface tablets or Android tablets – Splashtop helps you to reach your 1:1 – or BYOD – destination. Easily manage hundreds of teachers and students using the on-premise version of Splashtop Classroom. Installed on your servers, behind your firewall and using your Active Directory it is a secure solution with no need to create additional user accounts nor access 3rd party servers. All connections are fully encrypted inside your organization. With a central, administration console, you can create, invite, and manage users using policies, report on usage for compliance, even authenticate which device teachers use. Everything is included for teachers and students – remote desktop access and control, annotation and video recording as well as sharing their PC or Mac screen with student devices – so there are no hidden costs. Whether you are using iPads, Chromebooks, Surface tablets, PCs, Macs or Android in a 1:1 or BYOD initiative, Splashtop protects your existing – and future – investments in mobile devices. Use Splashtop’s cost effective solution and be an ROI hero! – Troy Shoebridge, ICT/Network Manager, Rotorua Boys’ High School, New Zealand. Remove the headache of locating and connecting cables between your computer and the AV equipment. No need to read the AV panel manual! Just use the existing WiFi and classroom or podium computer to project your screen to all the devices in the room with ease! No need to purchase hardware such as Crestron AirMedia or other expensive wireless projection systems.